LookLocalWA's Perth directory puts you in touch with Ceiling Repair specialists near you. WHETHER it is five, 10 or 20 years after your home was built, cracked walls, sagging roofs and wear and tear are common problems all homeowners will face. Just like a vehicle, your home or office will require maintenance servicing over the years to ensure it is not only looking great but does not cause any hazards to safety. If damaged ceilings, water damage or cracked walls sound familiar, you have landed in the right place, where you will find a wide selection of listed tradespeople that specialise in installations and ceiling repair - Perth or your local area! From new home installations, office fit outs, restoration to general repair and maintenance for ceilings and walls, you are certain to find a person for the job on LookLocalWA. A qualified tradesperson will be able to help with a number of areas of ceiling repair - Perth. Starting with the standard patching of water damaged ceilings, paint jobs, replacements, plasterboard repairs, insurance and house extension work to detailed jobs like bulkheads, ceiling roses, decorative fibrous plaster, battens and decorative cornices. Other areas they may be able to help with include fire rated plasterboard ceilings, theatre room walls and ceilings, suspended ceilings, glass office partitions, sound proof walls, grid ceilings, archways, man holes, door frames, stud walls and more. 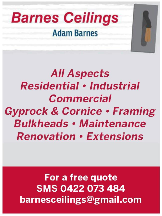 Since your home or business is an investment for life, enlist the help of an experienced tradesperson who will determine the problem and carry out maintenance and repairs which meet professional Australian standards. Are you a tradesperson offering ceiling repairs - Perth? Get listed on LookLocalWA today! I have been in this trade for 39 yrs and enjoy what I do. I am there to please you and give the best information to you. Established in 1998 & based in North Perth we are a family owned and run business experienced in the installation of plasterboard ceilings & stud walls, specializing in the installation of a wide range of plaster-glass products. Awkward or difficult work is no hassle! Top quality work assured by quality tradesmen. Riverside Ceilings has been helping people of Perth to keep a strong roof over their heads for 20 years. We provide an obligation free quote, a guarantee on our work, and a prompt and clean service. Riverside Ceilings also provides an emergency repair service. Why replace your sagging ceiling when you can repair? !